Epic Birthday Parties with the PRIZE CUBE! Roller Kingdom birthday parties are always special occasions, but now they are even better because we’ve got an added element of fun! Hudson birthday parties now include a visit to our brand new Prize Cube in addition to roller skating. 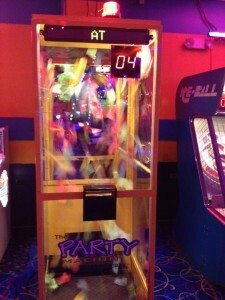 When the birthday child, teen, or adult enters the Prize Cube, they will have 15 seconds to gather as many prize tickets as possible in a whirlwind of fun. Prize tickets will be swirling and whirling around the Prize Cube for our birthday guest of honor to catch. You may think you’ve seen similar cubes elsewhere, but the Prize Cube at Roller Kingdom is one of a kind. In fifteen seconds a birthday boy or birthday girl will manage to catch as many prize tickets as they can. Some may think that fifteen seconds seems like an eternity with time standing still as prize tickets fly around in every which way. Whatever prize tickets are snatched from the air in the Prize Cube could equal some pretty awesome stuff. Are you wondering what this awesome stuff includes that our birthday honorees could have snagged? The awesome stuff up for grabs, with the capture of the right tickets, includes tasty treats from our snack bar, free skating passes, and a pair of brand new roller skates! We suggest that you don’t delay! There is no age limit in place, and you know that all guests will have a great time spinning their wheels out on our rink! Call us at 978-562-3439 or click here to schedule your next birthday party at Roller Kingdom in Hudson.